Editor's note: The following essay is an excerpt from the new Hoover Press book What Lies Ahead for America's Children and Their Schools. In the nineteenth century, Herbert Spencer famously posed the question underlying all curricula: what knowledge is worth the most? Conflicting answers to that question have generated political controversy throughout the history of the American school—and especially in the 1990s—primarily because of a philosophical conflict between what have become known as traditionalist and progressive camps. This essay sketches the evolution of that conflict from the 1990s to the current day and evaluates its impact on the content and breadth (time spent on subjects) of the school curriculum. Although the most heated curriculum wars quieted down by the mid-2000s, two forces loom on the horizon that may reignite them: new technologies and the Common Core State Standards. Indeed, skirmishes over the Common Core have already taken place. I conclude by discussing specific areas in which future research can make meaningful contributions. The 1990s featured fierce battles over curriculum in the four major K-12 school subjects: reading, math, science, and history. In reading, believers in "whole language" methods struggled with phonics and code-based advocates. In math, the NCTM (National Council of Teachers of Mathematics) standards documents first swept unopposed across the land—spawning new textbooks and dominating policies ranging from National Assessment of Educational Progress tests to National Science Foundation grants to state standards and assessments before confronting a powerful backlash. In science, advocates of hands-on, project-based learning struggled with advocates of content-oriented curriculum. And in history, multiculturalists and believers that the teaching of U.S. history should devote more time to past national sins (in particular, the mistreatment of blacks, Hispanics, Asians, Native Americans, and women) struggled with opponents who charged them with foisting an ideological agenda on the schools. The curriculum wars were fueled by the rise of standards in the late 1980s and early 1990s. Progressives and traditionalists had argued over the curriculum throughout the twentieth century. But the arguments had mostly remained confined to education schools, perhaps bubbling up in communities that adopted new textbooks or curriculum guidelines. Primarily, this was an argument among academic rivals and professional educators. That all changed when standards and assessments were pinned to accountability systems. The notion that states declare the learning objectives schools should pursue, and perhaps even attach rewards or sanctions to their attainment ratcheted up the importance of the official curriculum adopted by authorities. The curriculum wars then subsided. What happened? Science and history debates were pushed aside, at least from the public stage, by the focus on reading and math in state and federal education reform. Whole language was routed from state-level reading policy by more than one hundred bills passed by legislatures. The federal Reading Excellence Act (1998) supported programs backed by “scientifically based reading research,” a mandate reiterated in Reading First, a component of the No Child Left Behind Act (2002). Some of the tenets of whole language—workshop models of instruction, an emphasis on student-centered learning, the prominence of authentic texts—were absorbed into (and some would say disguised by) “balanced literacy” reading programs. In mathematics, the NCTM moved back toward the middle of the progressive-traditionalist continuum, first with a more moderate set of standards in 2000 and then, dramatically, with the release of "Curriculum Focal Points" in 2006. The treatment of whole number arithmetic illustrates the philosophical shift. The 1989 standards urged teachers to de-emphasize computation skills in favor of problem-solving, going so far as to disparage the elementary grades’ teaching of whole numbers and fractions as outmoded “shopkeeper arithmetic.” Calculators could take care of any future computational needs. "Focal Points" not only endorsed the learning of whole numbers and fractions, it made them the centerpiece of the elementary math curriculum. As the country moved into a new century, the most controversial of the 1990s math reform curricula lost market share and vanished. Publication of MathLand, at one time the most widely used textbook series in California, was halted in 2007. An empirical means of tracking changes in curricular emphasis is to examine the amount of time schools spend on the core subjects. Tests mandated by NCLB and state accountability systems compelled schools to focus on reading and math and on the attainment of basic skills by low-achieving students. Critics charged that such an emphasis narrowed the curriculum. There is evidence supporting the charge but conflicting accounts on the magnitude of the narrowing. From 1988 to 2004, the Schools and Staffing Survey teacher questionnaires indicate that teachers in grades one through four increased time spent teaching English language arts and math by about an hour per week, with a commensurate decrease in social science and science. A 2004 study in Florida found that schools labeled as failing on the Florida Comprehensive Assessment Test (FCAT) spent an inordinate amount of time in the following year teaching writing, the section of the FCAT that the state’s educators believed was most amenable to improvement. A pre-NCLB study of Kentucky classrooms by the Rand Corporation exploited the fact that accountability in that state was linked to different subjects in different grades. It found that fourth grade teachers spent about four hours more per week on the subjects targeted for improvement in fourth grade, while fifth grade teachers spent about six more hours a week on the subjects tested in fifth grade. The Center on Education Policy surveyed district superintendents in 2007 and asked them to estimate changes in instructional time from 2002-2007. More than half (58 percent) reported that classroom teachers had increased the amount of time spent on English language arts; 45 percent reported increased time on math instruction. Districts that increased time on English language arts averaged an additional 141 minutes per week on the subject; for math, the figure was 89 minutes. A significant percentage of districts reported decreased time spent on social studies (36 percent), science (28 percent), and art/music (16 percent). In sum, over the past fifteen years the content of the curriculum has been buffeted by longstanding philosophical debates. In the 1990s, math and reading were both strongly controlled by progressive ideas, but that influence was subsequently diminished by federal and state legislative action and the rise of accountability systems focused on basic skills. Arguments over science and social studies/history were pushed out of the limelight. Accountability systems have also precipitated a shift in instructional time away from non-tested subjects in favor of reading and mathematics. 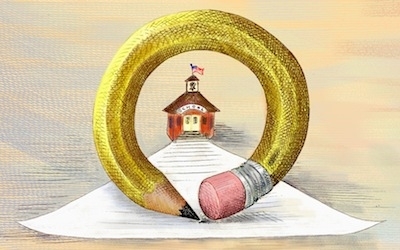 To critics, narrowing the curriculum is bad, but it has not generated much public opposition. To many people, narrowing the curriculum is nothing more than focusing on the essential knowledge and skills that all children must learn. Compared to the 1990s, a relative calm presides over today’s curriculum politics. What’s in store for the future? Two powerful changes lie ahead that have the potential to provoke controversy by inflaming the old progressive-traditionalist philosophical debates. The proliferation of computer-based instruction and online schooling has many observers excited by the promise of technology to fundamentally reshape education. Terry Moe and John Chubb argue that once students are no longer dependent on brick-and-mortar schooling, the mammoth institutions built to deliver traditional instruction—and the entrenched interest groups (e.g., unions) that benefit from current institutional arrangements—will wither away. Clayton M. Christensen, Michael B. Horn, and Curtis W. Johnson argue in Disrupting Class: How Disruptive Innovation Will Change the Way the World Learns that technology will “change how the world learns.” They foresee a digital storehouse of modular online learning activities that can be customized to each student. Although technology may indeed change how students learn, the curricular question is whether it will also change what students learn. Christensen, Horn, and Johnson also embrace a close cousin of multiple intelligences: learning styles theory, the notion that students learn material best that is presented “in ways that correspond to how their minds are wired to learn.” The authors call for new assessments that will accommodate different learning styles, describing a student who, “blessed with bodily-kinesthetic intelligence” but weak in mathematics, struggles to learn chemistry: “we’ll need to find ways to compare his mastery of a body of material with the mastery demonstrated by someone whose intelligence is in the logical-mathematical realm.” This sounds an awful lot like a chemistry test for athletes and dancers. The Big Idea behind learning styles is that kids vary in how they learn: Some learn best by looking (visual learners), some by listening (auditory learners), and some by manipulating things (kinesthetic learners). The prediction is straightforward: Kids learn better when they are taught in a way that matches their learning style than when they are taught in a way that doesn’t. The data are straightforward too: It doesn’t work. The point here is that the proliferation of new technologies will not only affect instruction, the how of learning, but may also affect curriculum, the what of learning. That proposition is sure to ignite the historical conflict between educational progressives and traditionalists. Moreover, individualized instructional programs, whether delivered exclusively online or through “blended” regimes, are antithetical to the goal that all students learn a common body of knowledge and skills at approximately the same time. If individual interests and pre-existing cognitive skills determine what is learned and when it is learned (i.e., “each student learns at her own pace”), demographic characteristics that are correlated with personal interests and cognitive skills will mirror how far students proceed through the curriculum. Achievement gaps based on socioeconomic characteristics will surely widen and solidify. The Common Core State Standards project starts from a premise diametrically opposed to the technologists’ philosophy of individualism. Common Core supporters believe the content of learning should reflect what a society wants students to learn, that such content can be spelled out with specificity, and that assessments should measure whether students have learned, and schools have taught, the authorized content by a stipulated time. A math standard stating that by the end of second grade students will know how to subtract one three-digit number from another three-digit number does not mean students will learn it at their own pace, with some mastering the idea in second grade and others taking two or three more years to learn it. Nor does it mean students will learn subtraction when they find it interesting or only after they have grown tired of drawing unicorns. The description just presented casts the Common Core in terms appealing to education traditionalists. But many traditionalists are critical of the Common Core. Why? Because the Common Core also contains elements that are currently ambiguous as to the ends they are intended to accomplish. These elements are fuel for rekindling the progressive-traditionalist curriculum wars. 1. Process over product. The Common Core can be used to justify many things, including questionable approaches to learning. When a particular activity comes under fire, local educators seek political cover by claiming that district or state policies (or the Common Core) made them do it. Recently, the Common Core project released "Standards for Mathematical Practice," guidelines related to practice, not content. Giving process equal status with content drew the ire of traditionalists in the 1990s math wars. Students in the class were forbidden to add numbers in a column. Instead, they were forced to decompose the numbers and show them graphically (draw them), as called for in the Common Core. The parents met with the teacher and principal. The teacher claimed this laborious approach (based on math theories from the Freudenthal Institute, also the founders of the PISA test) revealed students’ conceptual understanding of addition, an example of the “deeper learning” called for in the Common Core. The school’s principal also defended the approach for reflecting the objectives of the Common Core. 2. Non-fiction texts. English language arts teacher are up in arms over the Common Core’s suggestion that teachers should try to balance the assignment of non-fiction and fiction readings. This criticism is mostly inside baseball, limited to ELA teachers. Common Core leaves the selection of texts to local educators. The real battles will come when stories surface of teachers assigning controversial texts as required readings. Controversial texts are assigned currently, of course. But in the future, the Common Core will be cited as justification (again, providing political cover). 3. Integrated math courses. Math reformers have long dreamed of eliminating year-long high school math courses taught by topic (algebra, geometry, calculus) in favor of integrated math courses that weave major topics together in composite courses called math I, math II, math III (equivalent to freshman math, sophomore math, junior math, etc.). Most of the world’s countries currently organize math curriculum in the integrated way; the United States is an outlier in not doing so. But this reform has been tried repeatedly (most recently in the state of Georgia) and it has repeatedly failed after stern public opposition. Many teachers are not comfortable teaching an integrated math course, and parents fear taking such a course will jeopardize their children’s preparation for college. Currently only 3-4 percent of US high school students in any particular grade (and less than 10 percent of all graduates) take an integrated math course. And yet, the Common Core accords integrated math and topic-oriented math courses equal standing, with standards and assessments written for both. This is understood to be a way of encouraging the use of integrated math courses. Seattle schools have already announced their intention to switch to integrated courses. Watch for a firestorm of opposition in many communities. 4. Tracking. William Schmidt of Michigan State has declared that the Common Core means an end to tracking in math through eighth grade. Tracking typically starts in seventh or eighth grade, placing kids in courses that match the hierarchy of the math curriculum. Nationally, about 6 percent of seventh graders take algebra I. Students who take and pass algebra I typically then take geometry or algebra II in eighth grade because, presumably, they are prepared for it. That would end. De-tracking created political turmoil in many communities in the 1990s. Look for controversy to return if the Common Core is interpreted as meaning all students will take the exact same courses. The phenomena described in this essay are political in nature. They stem from ancient philosophical disagreements over what students should learn. Progressives and traditionalists battled over the curriculum in the first two decades of the twentieth century (practical vs. “book-based” learning), in the 1920s (project-based, experiential learning vs. traditional intellectual disciplines), in the 1940s (curriculum for personal adjustment vs. curriculum for knowledge and skills), in the 1960s and 1970s (student-centered, open classrooms and inquiry learning vs. teacher-led classrooms and basic skills), and in the 1990s (over standards, as described above). It is reasonable to believe that the politics of curriculum, which have been relatively dormant in the past decade, will become heated once again. First, much more research is needed on the effectiveness of different curricula. We need to find out what works, whether it is progressive or traditional in approach. The trick is to identify a set of outcomes that rival camps believe are worthy of attainment. Mathematica managed to do this with a random controlled trial of four elementary math curricula, but that kind of study is rare. Second, research is needed on the impact of the Common Core on curriculum as the implementation of standards and tests unfolds. Will students really be taught knowledge and skills that were not taught in the past? Are all of those programs advertised as “Common Core compatible” truly different from previous programs? Third, the linkages between curriculum and instruction are not well-researched. A common refrain of advocates is that teachers will have to teach differently to realize the potential of the Common Core. OK, that’s interesting but vague. Empirical evidence is needed showing that a particular set of instructional strategies is optimal when paired with a particular set of curricular objectives. Fourth, the evidence on technology and learning is sparse. Good evaluations of online learning are needed, whether curricula are flipped or blended or totally digital. Opponents are currently having a field day applying their demagoguery to the low test scores of virtual charter schools.